Totally fun accent rug specially for any play area or kids bedroom. Good quality and look for the value and fun bright color combinations . Love it ! Brighten any room with style and flair with this fun, eye-catching indoor area rug. Available in a variety of vivid colors, this polyester area rug is dazzling and flashy, making it perfect for children of any age to enjoy. The colorful dot pattern brings this piece to life and makes this area rug the focal point of the room. Great rug for our playroom. 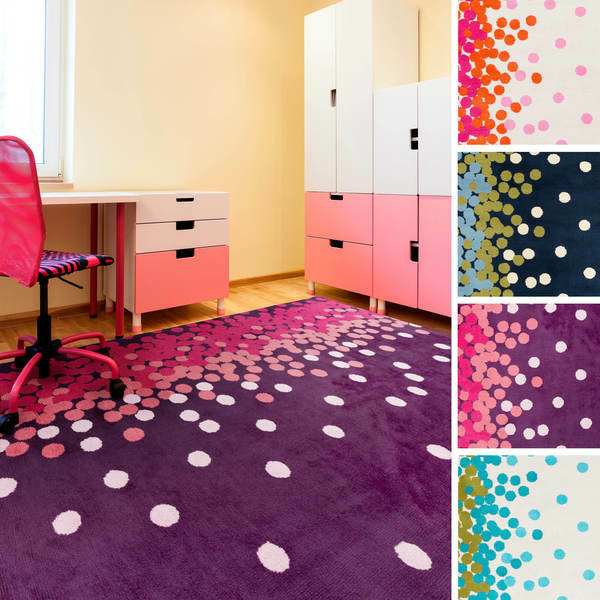 The pink dotted rug is bright, colorful, and sophisticated. Colors true to pictures. I bought the pink/orange dot rug 8x11. I would have given this rug a higher rating, but I'm really unhappy that the measurements are not what they tell you. Even the label on the back of the rug says that it is 8' x 11'. It's not, it measures out exactly at 7' 9" x 10' 8". I feel that I have been cheated. It is very difficult to return a rug once you already lay it down so I guess I'm stuck. I'm not blaming Overstock since the label gives the size that they quoted. I understand that the rugs they sell are slightly flawed, so maybe this is the flaw on this one. Other than that, it is soft and true to colors. Arrived in 5 days. 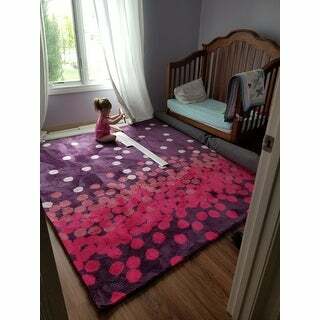 We love this rug in our daughter's room so much we're buying one for our son's room too! It is super soft and because we chose the navy and purple rugs- they are bright and beautiful! I put this in the kids playroom -- definitely very nice and colorful. The rug is also very plush and the kids love it. My only concern about this rug is that it's not as fluffy after a few weeks as it was when it first arrived. It is, hoever, still very soft (my 3 year old son says the rug feels like a kitten). The pattern is contemporary and elegant, but unique and playful. The design and color are wonderful. The rug is very soft. It vacuums well. It seems a little less durable than some other rugs I have purchased, but it's holding up well after a year. For the price and soft feel and great look in my daughter's room, it's a great buy! Overstock was great when we had to return the first one- wrong color- and reorder. Amazing customer service! Great rug. Exactly what i wanted. My girls picked this rug. It is very soft and pretty. I would have given it five stars but it came with some gluey substance on one spot along the edge. Softer than i expected. the pile is higher than i expected. Time will tell if it holds up. "What is the bottom side of this rug? Is it fabric backed?" "are the green dots in the navy rug more on the sage side or lime green?" "Would you know when the Blue color option will be available to purchase?" We hope to restock the blue if it becomes available again. Please check back with us periodically.